I'm Thaddaeus Smith, executive chef at Sterno Candle Lamp, today we're going to talk about setting up a chafing dish for a buffet. It's simple and it's easy if you follow these tips. Elements of a chafing dish. There are a lot of different chafing dishes on the market, but they all function basically the same, so we're going to go through a chafing dish that many people have, and the different elements. Remember, this applies to most chafing dishes on the market today. Lets start with the rack, this is where the chafing dish will come together so you have a nice, hot, buffet service for your guests. There are fuel holders here. This our water pan we're going to put between three quarter and an inch and a half of very hot water to start into this pan because we don't want the fuel being used to heat up the water, because the water is already going to be hot and the fuel is going to keep it warm. Leave our food pans. Remember we're not cooking food, we're keeping food warm so we want to put hot food in these pans. That's food that's above 140 degrees Fahrenheit. This is the fuel, very important for the success of any buffet. Sterno safe heat this is a 4 hour product, the nice thing about this product is the can stays cool throughout the entire burn cycle. This is a terrific product, burns for 4 hours. We also have a stick lighter very important to light the fuel. This is our stainless steel pitcher, you wanna use stainless steel because you're using hot water that you pour into your water pan. This is our fuel holder. The fuel is going to go right in here so you can either regulate the amount of heat that's coming out or you can extinguish it very easily and those are going to go right into here. So, let's set up our buffet. For safety's sake, you always want to be sure that your chafing rack is going to be set up where you're going to be doing your service. You don't want to be transporting things back and forth from the kitchen. Have it set up where you want to serve, that's the safest way to do it. First thing we're going to do is take the chafing holders, put them in place. Next step, my favorite step, it's the Sterno four hour safe heat fuel. Remember wick product, this can, though produces a great deal of heat, stays cool during the burn cycle. We will place these in the fuel holders. Now we're ready to go! The fuel is in place, now it's time for the water pan. The water pan goes in here, now i'm not carrying hot water in from the kitchen, in this pan, and putting the pan in place. We're going to take the hot water, this is very hot, between three quarters and an inch and a half. Next step is to light the fuel. Now you see the fuel is in place, i'm lighting it after it's in place, the water is in the water pan. And now w'ere going to put the hot food into the water pan. Our vegetables today are roasted peppers. Remember, these are coming out of the kitchen hot, this pan is hot, above 140 degrees we are not cooking food, we're warming it in our chafing dishes. Our protein, roast chicken. Now, water pan is hot, fuel is going, food is in place, your guests will be arriving in 10, 15, 20 minutes, place the lid on, and your ready to roll. When service starts, simply put the lid over here, place your serving utensils in, and you can let the party begin. When service has ended, simply put the lid back on the food pan, and extinguish the fuel. Now you are ready to tear down, get cleaned up and go home. Lets review very quickly. Remember you want to have all your elements ready to go before you start service. You want to make sure your chafing dish frame is where you're going to be serving so you don't have to keep going back and forth from the kitchen. Start with hot water in the water pan (110 degrees Fahrenheit or above). Remember we're not cooking food, we're warming food, so that hot water will go a long way keeping our food in the safe zone, which remember is of 140 degrees. Hot food hot, cold food cold for food safety. Also you want to make sure you are using the proper chafing fuel, we recommend our 4 hour safe heat, very safe, can stays cool throughout the burn cycle, keeps food well above 140 degrees. For more information about all of our products as well as some great safety tips visit Sterno Candle Lamp University. We'll see you again soon. While many buffets and caterers use chafers, it's important to know how to properly set one up. Watch this video on how to set up a chafer so that you're always serving food kept at safe temperatures to your guests. With a Sterno Products chalkboard chafer, you can create an artistic display to promote your most popular specialty dishes! A charcuterie design is particularly great for showcasing savory meats, like steaming pork belly or bacon. Watch the drawing process here for inspiration! 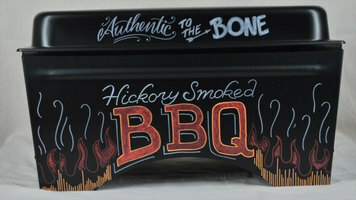 Create a visually appealing presentation at your next BBQ event by decorating your chalkboard chafer with smoking hot graphics! 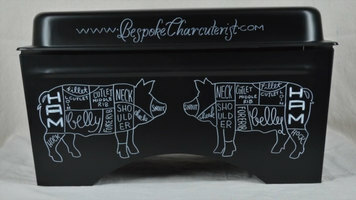 With just a few chalk markers, you can not only label the chafer, but draw on smoke, flames, and a witty slogan to entice guests. Watch the design process here! Want to add a personal touch to your catered event? 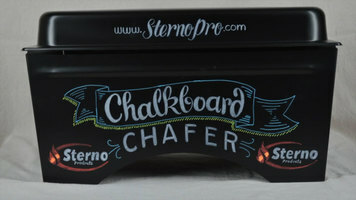 The chalkboard chafer from Sterno Products is a great solution! Just grab a chalk marker and draw, write, and create a custom design to suit the occasion, making it an event to remember.